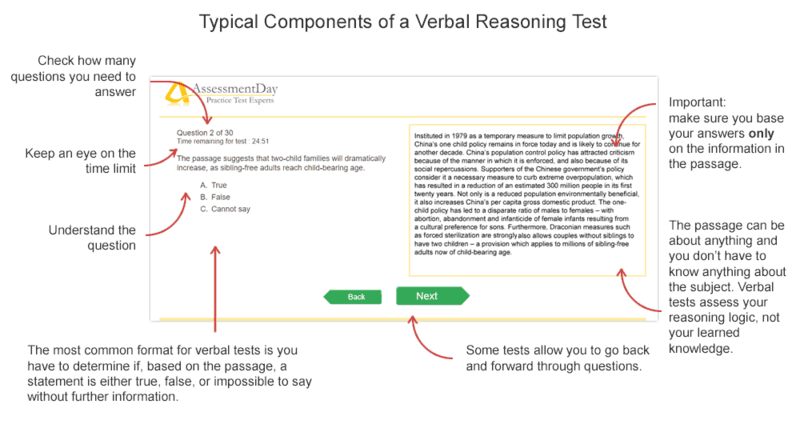 Practice tests, solutions, and tips to help you pass employers' verbal reasoning tests. Our experts have all the advice and practice tests you need to prepare for your test. The practice tests on AssessmentDay simulate the tests used by employers, so take some of our example questions now to become familiar with the industry-standard style and layout. The best way to perform your best in a psychometric test is to be familiar with the test format and know what to expect. Practice is the best way to maximise your chances of test success. Why do employers use verbal reasoning tests? Because they are better at predicting candidates' job performance than interviews, CVs and other traditional methods of selection. To quickly get a feel of what a real verbal reasoning test looks like, take one of our free practice tests below. Employers use your verbal reasoning score, together with other selection factors such as interview performance, to help them decide which candidate is most suitable for the role. Verbal reasoning tests used in selection usually take the form of a written passage followed by a series of questions with possible True, False or Cannot Say responses. It is important you know and appreciate the meaning of each response if you are to score highly. True - The statement follows logically given the information contained within the passage. False - The statement cannot logically follow given the information contained within the passage. Cannot Say - It is not possible to determine given the information contained within the passage alone; i.e. more information would be required to say for certain. So what's the best way to prepare for your verbal reasoning test? Easy: practice example questions and read the advice on this webpage. If you prepare properly for your test you will have nothing to worry about. Being prepared and knowing what to expect in your assessment is the best way to perform your best. Try a real verbal reasoning test.. Give it a go to see how a real test works! This free verbal reasoning test contains 30 questions and has a time limit of 25 minutes. This free verbal reasoning test contains 30 questions and has a time limit of 20 minutes. Is verbal ability testing fair? If it's done properly, yes. A verbal reasoning test is much more fair on candidates than a subjective form of assessment, such as an unstructured interview, because it presents questions of similar difficulty to all candidates and is objectively scored. The results from verbal reasoning tests also tend to be less affected by background or race, so they are beneficial to both candidates and employers. Q: What will my test be like? By far the most common form of verbal reasoning test is one in which you are presented with a passage of text, then asked whether certain statements relating to that text are true, false, or impossible to say without more information. Some employers also test things such as word meaning, for example "which word is the odd one out". But these are rarely used anymore as they can be culturally biased. Although this particular style of verbal reasoning test is the most common, it always helps to contact the human resources department of the employer and try to obtain any information you can about the actual tests you will be taking. They are normally very good at providing you with information about the test and sometimes even tell you what test publisher they are using. Q: What will the test measure? Verbal reasoning tests are designed to measure your powers of comprehension, reasoning, and logic. You will be tested on whether you jump to conclusions or you appreciate the limitations of a statement. If a passage says "it has been reported..." it does not follow that the reported aspect is necessarily true; only that it has been reported. Another classic example is: if the lights in a house come on, does that mean there is someone inside the building? Not necessarily. If A is bigger than B, does that mean B is small? Not necessarily. You will be tested to sort fact from inference, a lot like what's required in a real work environment. You can see why lawyers almost always have to pass a verbal reasoning test, or a critical thinking test. Something which will not be tested by the verbal reasoning tests used by employers is spelling. The employer is trying to measure your reasoning ability, not your vocabulary or spelling. This knowledge can be learned on the job, whereas verbal ability is an innate capability unique to each person. Recruitment tests are nothing to do with old-fashioned tests such as word association or missing words. Q: Do I need to be a fast reader? It helps, but more important than speed is how well you understand what you are reading, and recognising the difference between fact and inference. Aptitude tests are normally strictly timed. The assessor will be able to see how many questions you attempted and how many of those you answered correctly. So you will need to strike a balance between attempting lots of questions and getting correct those you have attempted. For most aptitude tests you will find it difficult to answer all the questions within the time limit. However some tests allow a lot longer and they are all about your analysis and reasoning ability. 1. CEB SHL Verify Ability Tests - SHL (now part of CEB) are the most widely used test publisher so you are likely to come across their tests during your application process. Their verbal tests have a time limit of between 17 and 19 minutes so you will need to work quickly and accurately to perform well. 2. SHL VMG - This series of tests belong to a test battery known as MGIB (Managerial and Graduate Item Bank). The questions on the test are selected from an item bank, with each item chosen based on its difficulty level, and its content varying in each test to prevent candidates sharing answers. The VMG takes 12 minutes to complete and contains 24 questions. 3. Talent Q Elements Verbal Ability - The big difference with these tests is that they are adaptive. That is to say the difficulty of each question is automatically determined by your performance in the previous question. So the questions become more difficult as you progress in order to quickly find your level of ability. A typical time limit is 90 seconds for questions with a fresh set of information and 75 seconds per question after that. Also the number of multiple choice options is a lot greater compared with what you might be used to from SHL, making it more difficult to make a best guess. 4. Criterion Partnership Utopia Verbal Critical Reasoning Test - These tests have an environmental theme. There are 30 questions with a time limit of 20 minutes but beware the questions get progressively more difficult. 5. Cubiks Verbal Reasoning for Business - Designed to test candidates' business-orientated verbal reasoning skills. You usually get less than a minute per question. 6. Kenexa/PSL Advance Verbal Reasoning Tests - This series of tests contains two levels: general ability and graduate/managerial. The general ability test comprises 24 questions and an 18 minute time limit. The graduate and managerial test comprises 32 questions and a 25 minute time limit. 7. Kenexa/PSL Infinity Verbal Reasoning Tests - Unlike other verbal reasoning tests, these have a number of fixed comparable tests. 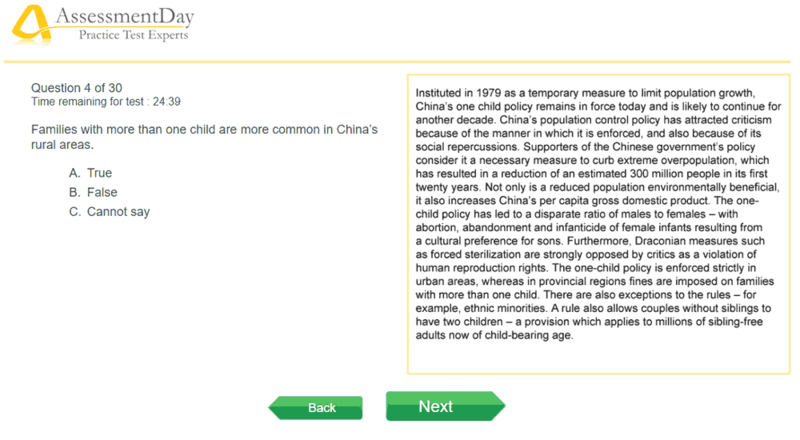 The test takes 20 minutes to complete and is comprised of 24 questions. 8. Mendas Financial Reasoning Test - a mix of verbal comprehension and financial ability. Slightly more information to take in compared with standard numerical tests. There are 22 questions with a time limit of 35 minutes. Used by the FCA, similar to the new financial reasoning test being used by the NHS. 9. Bespoke verbal reasoning tests - Some larger companies prefer to have their own tests created which closely match the situations candidates can expect in the job role. These tests vary slightly in style and time limit but you will still benefit from practising the industry-standard tests such as those on AssessmentDay. What's the best technique for these tests? Through practice you will develop your own technique for answering aptitude test questions to the best of your ability. However there is a general technique most people find useful to follow. Read the entire passage through once, then turn to the questions in-turn. Read the first statement and refer back to the relevant part of the passage to carefully consider if the statement is true, false, or impossible to determine without further information. It will often come down to just one or two sentences within the passage. Get a good night's sleep before your test so that you stay focused during your real test. Arrive in plenty of time so that when you sit down to take your test you are calm and collected. Make sure you understand the instructions. If your test is at an assessment centre the test administrator will explain the instructions and you will have the opportunity to ask questions. You usually get to go through a couple of example questions before the test begins for real. You will not be allowed to ask questions once the test has started, so make sure you take this opportunity to understand the test. Are you comfortable, is your desk wobbly, are you distracted by noise from the next room? Make sure you raise any problems before the test starts with the test administrator. Have an idea of how much time to allow yourself for each question and know when to move on. Concentration is essential, especially when every second counts. Don't let yourself get distracted by other test takers, this will slow you down. Don't guess. The administrator probably won't tell you if negative marking is being used but rest assured it rarely is in the verbal reasoning tests used by employers. Instead of guessing outright, often it is possible to eliminate one of the possible three answers, thus reducing your options down to two. Beware some tests do have mechanisms for detecting random guessing, and this won't look good when the employer sees that you're a slap-dash risk taker. So don't be tempted to quickly guess the last questions just before the time runs out. Base your answers on only the information contained in the passage. This is crucial, and if you don't do this you will probably get a lot of the questions wrong. Verbal reasoning tests are not tests of what you know, they are tests of how well you understand written information. Focus on the next test. Employers use a whole series of tests, interviews and assessments to select candidates. The results are used in the whole; it is not the case that a poor result in one test instantly removes you from the running. If you don't think you did particularly well in one test, try not to let this affect your performance in another test. Ask for feedback. Not all employers have the time or resource to offer this but it's worth asking. If you know how you performed, you can better prepare for that aspect next time.